Following the January 18 mass online blackout against the Stop Online Piracy Act (SOPA) and the PROTECT IP Act (PIPA), Congress flushed these contentious pieces of intellectual property legislation down the proverbial toilet thanks to a soiling of public outcry. And now a Kickstarter project wants to help you send these bills down the crapper again — literally. 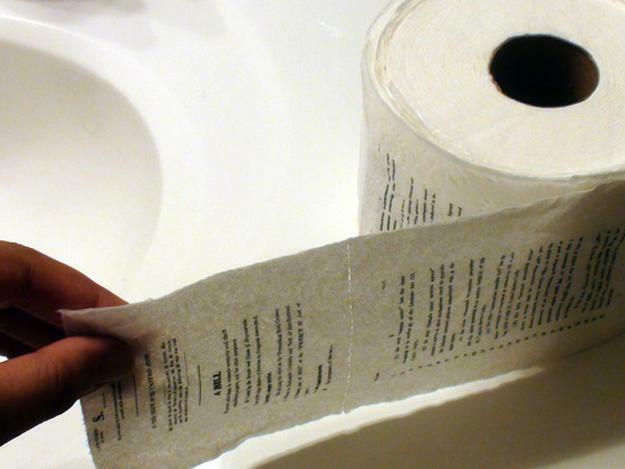 The project, known on Kickstarter simply as “Print the SOPA and PIPA bills on Toilet Paper!”, is exactly what it sounds like — SOPA and PIPA on toilet paper. According to the project’s creator, who goes by Craig R. (he told us he’d prefer that his “moonlighting as an entrepreneur not become official office gossip”), the point of the project is to create a symbol around which SOPA and PIPA opponents can rally. While Craig says the response to the project has been “really positive,” it’s not actually doing well on Kickstarter. At the time of this writing, the project had only raised $45 out of the $2,000 goal, which must be met within the next eight days in order for it to be a success. Craig says the money raised “would go towards finding a custom print shop to mass produce the rolls with all of the quotes and pictures on it, and [to] get a place to warehouse them.” The prototype roll, pictured above, was made using regular paper and his home printer.